The lava effusion dropped as well. As of yesterday evening, the two lava flows on the SE side were still active and 1500 m long while explosions at the vent were still reaching 400 meters height; by this morning, the lava flows continued to be active, but had decreased to a few hundred of meters length and are probably going to stop soon. After increasing gradually over the past week, the new so-called paroxysm (the 12th such phase in 2016 according to INSIVUMEH) started yesterday morning and seems now to be at its peak. Strombolian-type explosions and/or pulsating lava fountains eject glowing lava to 400 m or more, generating abundant glowing avalanches on the upper cone, and are accompanied by shock waves that can be felt in up to 15 km distance. Two lava flows of each about 2000 m length are descending the Las Lajas and Santa Teresa gullies on the southeastern flank. The explosions (13 in total recorded by INSIVUMEH during the past 24 hours) produced ash plumes of 500-1000 meters height. The stronger ones were accompanied by weak shock waves and caused ash plumes that drifted up to approx. 10 km before dissipating. The voluminous lava flows on the SE side erupted during the eruption in the past days (s. b.) were no longer alimented this morning according to INSIVUMEH, although their fronts and sides remain incandescent (likely, caused by the remaining fluid lava contained in their centers which continues to move a bit). INSIVUMEH reports moderate to strong explosions, glowing avalanches in all directions and noisy rumblings similar to a locomotive train. The FG3 seismic station records strong tremor and rockfall signals. An ash plume is rising to approx. 5000 m elevation and drifting SW and W, where ash fall is occurring in areas such as the volcano observatory in Panimache, Morelia, and El Porvenir villages. The unusual aspect is that it occurred during a phase of currently low activity with no active lava flow or intense explosive activity (as during the paroxysms). There seemed not to have been any precursor signs either. In a special bulletin from 7 April, INSIVUMEH reported that moderate and strong explosions at Fuego generated ash plumes that rose 850-1,050 m and drifted 15 km SW. The explosions were heard in areas as far as 20 km away, and were accompanied by shock waves that vibrated structures within a 12-km radius. In its bulletin this morning, INSIVUMEH reports strong tremor accompanying the rise of new magma. An ash plume has been rising to 5,500 m a.s.l. and drifting 25 km drifting to the S, SW and W, where ash fall is occurring. Strong shock waves from the explosions at the summit can be felt in several kilometer radius. People in the area should avoid being near in or near river beds, particularly on the SE side, because of the likely occurrence of pyroclastic flows - glowing avalanches triggered by the partial collapse of the steep lava flow, which can reach several kilometers length and have been produced during most of the volcano's recent similar eruptive phases. After its latest paroxysm a few days ago, activity of the volcano has returned to normal levels with intermittent (one every few hours) weak to moderate-sized strombolian explosions.  After the previous such episode in early March, the volcano had continued to produce its typical, persistent, but intermittent strombolian activity. The latter started to become more and more intense from around 22 March, and became near-constant during 24-25 March. The volcano's activity started to drop again to normal levels (intermittent small explosions) yesterday evening - the most recent paroxysm has now ended. Pulsating lava fountains at the summit vents generated an steam and ash plume that rose 2-3 km above the volcano, reaching altitudes of 17-20,000 ft(5.2 - 6 km). The plume drifted southwest for up to 20 km before dissipating. Constant moderate to strong rumblings can be heard and felt in nearby areas. After the latest paroxysm in early February, this would mark the 4th such episode in 2016. The images, taken early morning of 10 Feb, show very strong strombolian explosions, at the point to merge into pulsating lava fountains. The latter are mostly traveling down the southeastern flank into the large Las Lajas canyon where they have reached approx. 2 km length. Another flow seems to be active on the southern slope towards the Trinidad drainage. Most likely this activity will result in pyroclastic flows, as parts of the lava flows on the steep slope tend to collapse. Explosions have become stronger, and possibly, one or several short lava flows are active on the upper flanks. The thermal output of the volcano, measured by NASA's satellite-based MODIS spectroradiometer, also shows a clear increasing trend. Strombolian explosion at Fuego last night, seen from SE. When observed during the past night and this morning, strombolian-type explosions of small to sometimes strong intensity ejected abundant incandescent bombs in all directions from the summit vents. A small lava flow is active on the upper SE flank, producing often continuous glowing rockfalls that travel up to approx. 1 km towards the Las Lajas ravine.